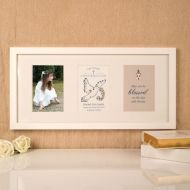 Quality is the only word to sum up these Bespoke Confirmation Frames. Knowing the illustrations were designed and hand drawn by a professional illustrator is a great start. Appreciating the detail is so good as a result of premium paper and a professional 12 ink cartridge wide format printer is reassuring. Knowing that the flat molded frame has been custom made for this design is a sign of attention to detail.